My husband enjoys woodworking projects. 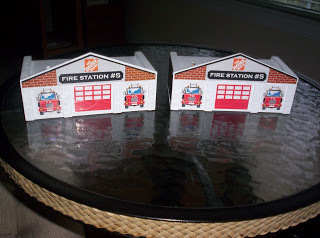 It’s not something that naturally lends itself to doing with our daughters, so it worked out well when our kind neighbor brought home two kits from a Home Depot Kids Workshop for making a Fire Station bank. 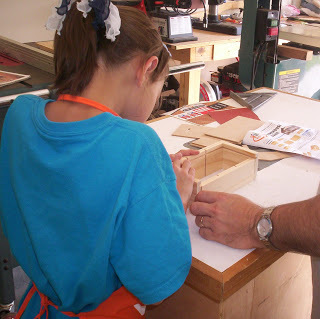 It was extremely hot on Friday afternoon, but my husband and our two daughters headed out to the garage to “tackle” their project with the girls in their orange Home Depot aprons. 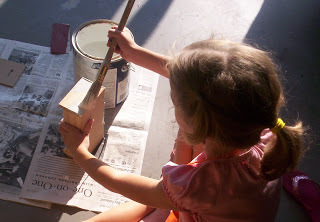 Daddy got to instruct them in using wood glue, hammering nails, sanding and painting. After the paint dried, the girls arranged the stickers and these cute banks were complete. Even better than the banks themselves is that they were able to spend some time working with Daddy and learning about something that he enjoys! See projects others tackled at Tackle It Tuesday and find more kid-friendly projects at Kid Friendly Friday. Some of my best memeories of me and my daddy are working on the car (I always handed over the tools he would need). Aaron came home from Home Depot last weekend with my hubby with the same bank. He wears the apron every day. What great fun! And a great life lesson too! That looks like such fun for your girls1 I have 2 girls also. That is great! I can't wait til my little one can do things like that with her dad! Cute! 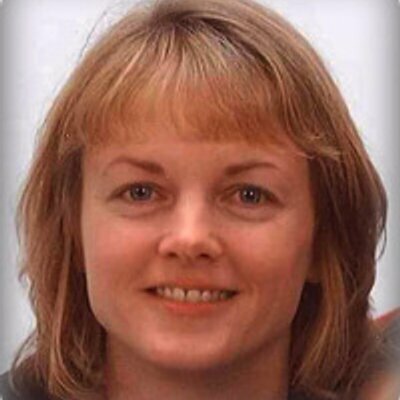 We are going to make some this Saturday….our home depot is behind.